The legal and political implications of 9/11 have turned scientific research in this area into a high stakes competition for the minds of the public. Pertinent information has been kept secret, the corporate media has systematically kept “damaging” information (such as video images of the World Trade Center Building 7) out of public view, 9/11 research has been marginalized, and the official investigations have failed to answer, or in many cases even address, the most troubling questions. One development that appears to be a tactic in the ongoing cover-up is the high profile promotion of transparently false theories, “straw men,” the only purpose of which appears to be to allow the 9/11 Truth Movement to be ridiculed. With the tenth anniversary of 9/11 upon us, the battle for public perceptions has intensified and there is a heightened campaign to undermine the scientific basis of the truth movement. One of the reasons why PFT may be reluctant to utilize the newly decoded last frame of data in the FDR file is that the concept that the plane could not have hit the Pentagon, and therefore must have flown over, is supported by the Citizen Investigation Team (CIT). In this paper we examine the flyover theory presented by CIT and find it to be false. 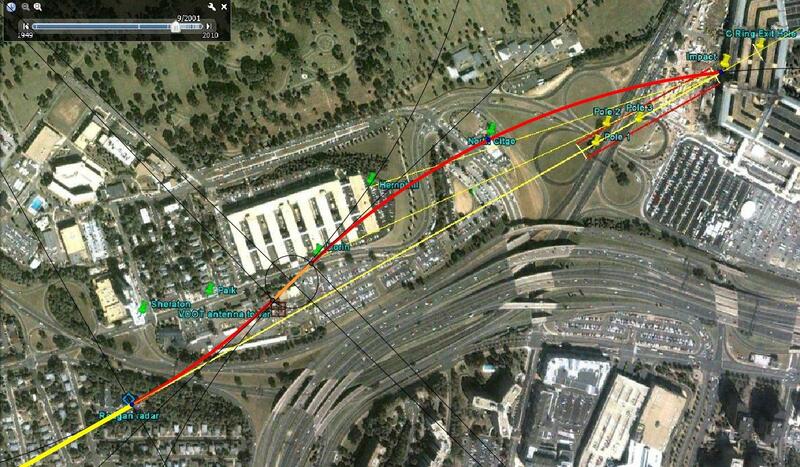 CIT claims (1) that the plane approached the Pentagon along a path too far north to have done the observed directional damage, (2) that all the damage was faked and (3) that the plane flew over the Pentagon. The apparently surprising claim that the plane flew over the Pentagon is a necessary part of the CIT position as it explains the lack of damage in alignment with the north path inside the Pentagon. CIT supports its theory with the testimony of a small number of selected witnesses, presented in selectively edited video interviews, who state that the plane passed north of the former Citgo service station.11 David Chandler and Jon Cole point out, among other things, that the CIT “…witnesses are not representative of the overall eyewitness pool”.12 Certainly their witnesses are not representative of the witness pool as there are very many more witnesses to impact.13 Gregg Roberts states that CIT’s work contains “logical fallacies”.14 CIT disputes the findings of Chandler and Cole at length 15 but provides no new evidence, and has intensified its personal attacks on anyone who criticizes their claims in blogs and Facebook. We do not assert that CIT is deliberately setting up false theories in order to expose the 9/11 Truth Movement to ridicule, but that is likely to be the ultimate effect of their efforts. Unfortunately the well presented videos and website of CIT have impressed a lot of people, so dissension has arisen, which is destructive to the 9/11 Truth movement. Michiel de Boer has suggested that the accumulated evidence that a large commercial aircraft hit and damaged the Pentagon is now so substantial that we should plainly assert that impact did occur.16 The natural corollary to the proposition that impact occurred is that the claimed north path, and consequent overfly of the Pentagon, is false. The physical implausibility of the north path proposition will be demonstrated in this paper. During the morning of 9/11 four planes were hijacked and the normal interception response failed. Two of these planes hit the WTC towers. These impacts were seen by many people and recorded on video. It cannot be rationally disputed that they occurred. The impact on the South Tower was recorded on several videos showing that the plane largely penetrated the building. Very clear photographs of the impact areas of both towers exist and it is clear that all but the wing tips entered the buildings. Some debris fell to the street below and was reported by eyewitnesses and photographed. The amount was small and appeared commensurate with the portion of the impact area not penetrated. In the case of the Pentagon the outer wall had been reinforced to an unusual degree during renovation so it appears reasonable that the impact hole would be smaller and that more of the plane would fail to penetrate the building. Photographs and videos show the entire wingspan of the plane damaged the face of the building but the entry hole was smaller. On the ground outside the Pentagon a substantial amount of debris was observed and recorded in photographs and videos. Again the amount of debris outside appeared roughly commensurate with the portion of the impact area not penetrated. As two incidents had occurred that morning in which planes had been observed to deeply penetrate buildings, it should not have been surprising that a plane could penetrate the Pentagon, and there was initially general acceptance of the impact report. Unfortunately, however, a number of observers saw the debris outside the Pentagon but did not see the sizable hole in the wall, more than adequate to allow most of the aircraft to enter. They reported that the amount of debris was not sufficient. Thus was created the fertile field in which alternative theories developed to explain the observed damage. The physical evidence at the Pentagon is consistent with the view that a plane with the wingspan of a Boeing 757 flew into the Pentagon 17 along a straight line at a heading of about 61°, damaging light poles, a fence and a heavy generator; largely penetrated the outer wall and caused a trail of further damage in the same direction inside. A best-fit line through the positions reported in the fully decoded FDR data file has a heading of 61.3° for the last 20 seconds of flight, similar to the heading of the radar data, which places the approach south of the former Citgo service station and therefore in accordance with the official account. The bulk of the eyewitness testimony is in agreement with the physical data and with these records. Despite this persuasive evidence, CIT continues to assert that the plane flew north of the Citgo (NOC) service station. This is the crucial assertion as only if it is true must we give consideration to CIT’s other assertions. To explain the very obvious damage, and to set aside the accounts of the many eyewitnesses to impact, CIT presents the theory that the damage was done by explosives and that the departing plane was hidden from viewers by the rising plume of smoke from these explosives. Contradicting this theory is the fact that most of the viewers were to the side and would not have had their vision obscured. Also, many of the viewers testified to seeing the actual impact. They didn’t just say they saw the explosion; they describe the low-level approach of the plane and the impact. Some were very close and it is difficult to imagine how they could have been mistaken.18 It is highly improbable that a person whose eyes were fixed on the plane as it approached the face of the Pentagon would fail to follow it over the roof, if it had in fact flown over. The absence of flyover witnesses is significant, given that so many people were known to be watching the approach. So far the arguments used against CIT have been mainly critiques of its methods. These studies indicate that CIT carefully selected witnesses who were prepared to say that they recalled seeing the plane passing NOC, and have avoided interviewing, or discounted, the many witnesses who recalled seeing the impact. There may be a handful of people who thought the plane was north of the official flight path, but there would have been hundreds of potential witnesses to a flyover, had it occurred, as the Pentagon has major roads passing by it on all sides and many vehicles were held up in traffic jams. That a plane flying over the Pentagon would be readily seen has been amply demonstrated by Jim Hoffman.19 Some counter that the view of the Pentagon would be obstructed by trees and guard rails, but there is a video from a moving car showing that the roof of the Pentagon would be visible for a great distance around the Pentagon.20 Some counter that the Google Earth images are misleading as they do not depict the buildings between the Pentagon and the surrounding roads, but there were no buildings tall enough to block the view of the roof of the Pentagon. Closer examination shows that, of the NOC witnesses, all who were in a position to see the Pentagon reported that the plane actually hit the building or that it was flying so low it could not miss.21 CIT casts doubt on the testimony of the witnesses to impact by asserting that the use of explosives, as the plane passed by, created a “magic show” which fooled them. Many witnesses realized, however, that the plane was about to hit the Pentagon before the smoke appeared, so could not have been fooled by it. By framing the direction of the approach as the central issue, CIT calls upon the witnesses to recollect what would have seemed to them to be a minor detail at the time, while ignoring, or explicitly discounting, their experience of the impact that would have been the clear focus of their attention and burned into their memory. While CIT has found these few witnesses who agree with the NOC flight path, it has been unable to find a single witness who endorses its flyover conclusion. One of their key witnesses (Lagasse) demonstrates clearly with his hands that the plane did not hit the wall straight on, and then says. “It kinda went in at an angle.” “When the plane hit it just kinda disappeared.” He indicated that his memory of the details may be open to question, but his memory of impact was not: “There is only one thing that is irrefutable … the fact is American Airlines plane went from here into the building. You can pick apart everything else …” 18 Another (Turcios) looked surprised when asked if he saw the plane fly over. He said “No. The only thing I saw was … direct line to go into the Pentagon. It collided.”22 Their third key witness (Brooks), who was across the street from the gas station, said that he watched the plane “… awfully low … just go nose dive into the Pentagon … full throttle … clip the lamp pole …” “… just the sheer impact … it just literally disintegrated the plane.”23 Clearly none of these witnesses is describing a flyover and none of them sounds uncertain or confused. By framing the question as they do, as a matter of approach direction, CIT cleverly sidesteps the crucial issue, whether the plane was high or low, and thus appears to be the party creating the real magic show. The classic witness to a low approach is Sean Boger, Air Traffic Controller in the heliport tower at the Pentagon. The glassed area of the tower extended round the side where impact occurred so he would have had an unobstructed view of the approach and the impact. “… coming right at us, and he didn’t veer.” “I am watching the plane go all the way into the building.” “Once the plane went into the building it exploded, and once it exploded, I hit the floor and just covered up my head. It was like glass shattering and ceiling tile was falling …” CIT says “more than likely he ducked,” trying to suggest that he couldn’t have seen the plane hit, but Boger’s words plainly contradict this speculation.24 Note the phrase “he didn’t veer,” indicating that the approach was not curved, as would have been the case had the plane passed NOC. CIT uses methods which must be regarded as questionable for a scientific discussion and has published a list where people who disagree with its views are named and ridiculed, apparently for the purpose of intimidation.25 What it does not do is apply necessary logical processes to the debate. It does not consider evidence against its hypothesis but simply insists that the NOC witnesses must be irrefutable because they corroborate one another. CIT glosses over the highly pertinent fact that the number of witnesses who corroborate impact is far greater, and it ignores the absence of flyover witnesses. On this basis alone its hypothesis must be regarded as flimsy, at best. Among the eyewitness testimonies we find several key witnesses who locate the plane south of the Sheraton hotel and the Navy Annex as it approached the Pentagon. We find that three of them, Ed Paik, Terry Morin and Albert Hemphill, are relied upon, but misrepresented, by CIT. 3. Ed Paik. 28 Eric Larson analyses the testimony of Paik, who saw the plane pass by while he was inside his shop, looking south through the window. The furthest north it could have been would be Columbia Pike, and the furthest south would be a little south of the VDOT antenna tower. CIT deceives the public by hiding the fact that Paik was inside his shop when he saw the plane. CIT touts the fact that they interviewed their witnesses on-site where they had originally witnessed the events, but the Paik interview was conducted outside, which colors his testimony. He seems to go along with CIT’s idea that the plane went over the shop, but this would be impossible to observe from his actual location. He is listed as a north path witness but should not be, as he and his brother speculated that the plane may have damaged the VDOT tower, which would indicate a south path, as they noticed something was bent on the tower and saw work being done there the next day. 4. Terry Morin. 29 On the referenced website Morin carefully explains how he was able to see the plane descending until it partially disappeared behind some trees. Morin indicates that the plane was not directly over his head as he was able to see its markings, not visible from beneath. Morin describes the plane traveling parallel to the Navy Annex and flying straight, directly toward the Pentagon. Given that he was on the ground near the Annex, only if the plane is on the south path, flying straight to the Pentagon, will it remain in his line-of-sight. CIT ignores his description of the path of the plane and claim him as a north path witness, though from his statement he must be a south path witness. CIT states that there is no south path witness; clearly we have found one already. Ranke then asked if it passed to the south of the VDOT antenna tower. 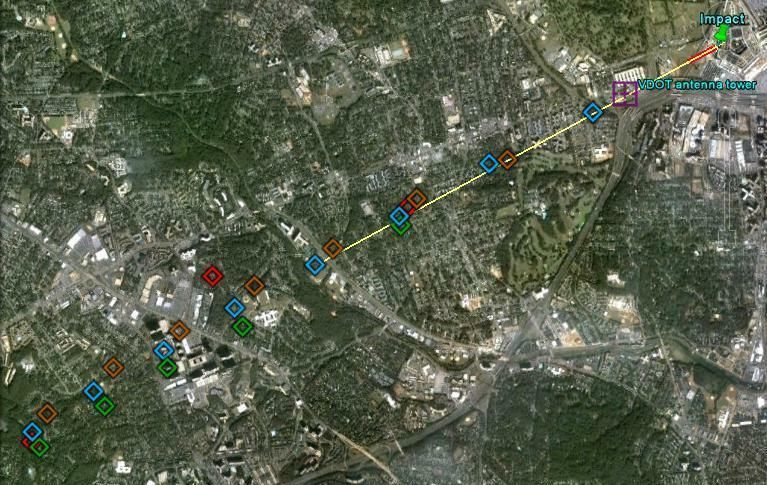 It is important to note that several of the witnesses Ranke was quoting “over and over” were near the Arlington cemetery. It is not reasonable to assert they could accurately judge from that distance that the plane was a little north or a little south of the Citgo service station. In contrast it would be easy for them to judge whether the plane was steeply banked, but all these witnesses stated the plane flew “flat” over the Annex and then banked only slightly, or made no mention of an unusual steep bank angle.32 Hemphill’s words “it didn’t turn right, it didn’t turn left” correspond with Boger’s phrase “it didn’t veer” and with Morin’s assertion that the plane was “heading directly towards the Pentagon”. All these observations contradict the NOC path, as will become apparent below where we discuss the angle of bank required. The evidence to this point leads us to infer that CIT has misled the public in regard to the witness testimonies, having failed to present the evidence of Lagasse, Turcios, Brooks, Paik, Morin, Hemphill and Boger fairly. It is our purpose to add another dimension to this discussion. Let us examine the dynamic feasibility of a NOC flight path. Radar could not provide useful information close to the Pentagon as, by then, the plane would be too low, but radar tracks from four different facilities corroborate each other, leading directly toward the Pentagon. The track from the nearest radar facility, at Ronald Reagan National Airport, reaches to a point only about 6 seconds prior to impact. This is close enough to the Pentagon to indicate that all the witnesses who mentioned the distance from themselves to the plane underestimated the distance, as can be seen in the following image (Fig. 1).33 Recall, for instance, that Deb Anlauf at the Sheraton, about 500 feet from the radar track, describes the plane as right outside her window saying, “You felt like you could touch it; it was that close.” Perhaps we underestimate distances in situations like this because we are not used to seeing large planes flying so low and interpret the large size as indicating closeness. From a statistical point of view it is unfortunate that there are many witnesses who were north of the path and few who were south of the path, close enough to form a clear impression of the position of the track, hence it is not surprising that there should be some northerly bias in the reporting. The FDR data extends the radar data for about 6 more seconds (Fig. 1) and shows no deviation right to the Pentagon. Figure 1: Four radar tracks approach the Navy Annex. The yellow line is the last 20 seconds of the FDR data, aligned with the trail of damage. It shows no deviation over this distance. The testimony of the witnesses cited above is in reasonable conformity with the path defined by the radar data, the FDR data and the damage trail. Some witnesses said the plane was coming along highway 395; some said it was coming along Columbia Pike, which runs close to the south side of the Navy Annex, nearly parallel with the closest section of highway 395. To be consistent with these witnesses the plane must have passed south of the Sheraton Hotel, south of the A-1 Car Repair shop of Ed Paik, and near Terry Morin. Morin may have been between the wings of the Navy Annex as the plane flew over, but said that he “ran to the outside” from between the wings to a “position where I could see it.”34 “As he starts to descend … he basically starts to disappear … the engines disappear, the bottom of the fuselage, the wings…” He followed the plane as it dipped down over a row of trees on its approach to the Pentagon until all he could see was the tail. He does not mention bank angle. Taken at his word, Morin witnesses a direct approach to the Pentagon along the south path. We will, however, loosen that assumption to enable our discussion to proceed further and in our initial analysis will simply assume the plane does not veer north until it has passed Morin. Already this conflicts with Morin’s testimony, in that it cuts short the distance that it would be visible to him, as will become evident below. To favor the NOC hypothesis as much as possible, we assume that the plane passed barely north of Citgo, in fact flying directly over the northernmost corner of the station. Finally we assume that, in order for the alleged “magic trick” with the smoke to work, the plane flew directly over the impact point on the west face of the Pentagon. For the sake of argument, we set aside the numerous observations of impact, the observations of the plane hitting light poles, a fence and a generator, and observations that it flew straight and descended very close to the ground. For the plane to follow a path that conforms with the remaining constraints, it must deviate from its initial path. It must first turn left and then turn right. Turns for aircraft involve banking and heightened g-force, which is the apparent gravity induced by centripetal acceleration. We make the assumption that the radius of curvature, and hence the g-force, is equal for the left and right banks. This is the assumption most favorable to the NOC hypothesis. Furthermore, for a large plane to transition from a hard left bank to a hard right bank requires a roll maneuver, which takes some time. For simplicity we assume that the plane flies straight during the brief transition from left bank to right bank. Fighters are small and have their mass close to the longitudinal axis of the plane, so they can roll quickly. Large planes, with their outboard engines and heavy fuel tanks in the wings, have a large moment of inertia and would require several seconds to make the transition. However, for the sake of argument we will consider the implausibly short left-to-right roll times of one second, and one half second. Shortening the assumed roll time allows more space for the bank maneuvers, thus favoring the NOC hypothesis. Speed is important as it is one of the two factors which determine angle of bank. Some of CIT’s witnesses estimate speeds of 350 to 400 mi/hr. These low estimates are uncalibrated guesses. There is good reason to believe that the testimony by the same and other witnesses that the plane was accelerating is more reliable, since it was based on the sound of the motors revving up. The distinctive sound of the engines would be more reliably assessed than the speed of the plane itself as our ears are sensitive to pitch. It is understandable that visual estimates of speed would be low, given that all the observers perceived the plane to be closer than it really was. If an object moving across the field of view is farther than the viewer estimates, the reduced angular motion across the field of view, due to distance, will be misinterpreted as being due to lower speed. Several witnesses use words like “spooling up,” “full throttle,” and “powered descent” to describe what they heard. We recall that Morin said he heard a “… steady high-pitched whine” indicating to him that “the throttles were steady and full.” The plane was also diving, so it had assistance from gravity in gaining speed. The FDR data indicates an average ground speed of 552 statute miles per hour (mi/hr) for the last 4 seconds and the final speed measured prior to impact was 556 mi/hr. The official estimate is 530 mi/hr, which is presumably based on the final speed shown in the original improperly decoded FDR file, 465 knots (535 mi/hr). The FDR file also shows that the engines were suddenly set to full power for the last half minute, during which time the plane accelerated rapidly and uniformly. Measurements of the radar positions, recorded every 4.7 seconds, shown in Fig. 1, provide independent confirmation of the speed and acceleration, as shown in Fig. 2. Distances were calculated using the Haversine method for great circle arc length, spherical earth approximation, from latitude and longitude. 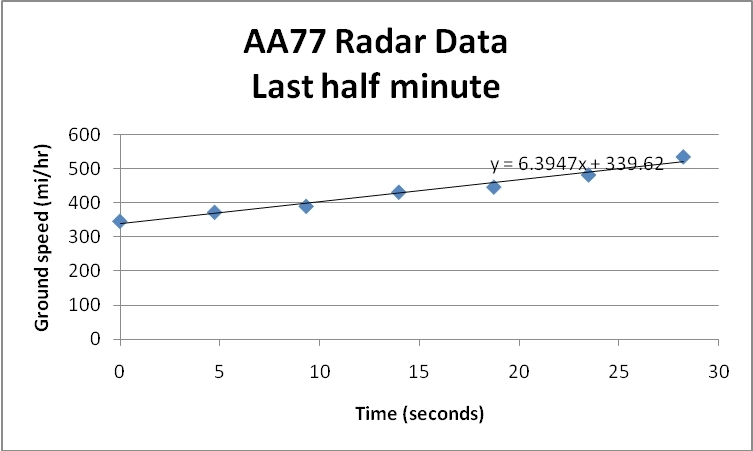 Figure 2: Radar data from Ronald Reagan National Airport (the nearest source) confirm the acceleration shown in the FDR file, in conformity with witness reports of hearing the engines “spooling up”. A trend line through this period gives a last 4.7 second interval averaging 520.2 mi/hr, accelerating at 6.39 mi/hr/s. Extrapolation of these figures to the next interval would give an average speed of 550.3 mi/hr, and after a further 2.35 seconds to the end of the interval, which would be very close to the moment of impact, the speed would be 565.3 mi/hr. The last measured speed in the FDR file was 556 mi/hr. This is recorded in word 94. The impact is recorded in word 225, thus 131 words later. Each word is 1/225th of a second hence 0.58 seconds elapsed prior to impact. If the calculated acceleration was maintained during this period the final speed would be 560 mi/hr. The radar data thus lead to a final estimated speed which corresponds well with the FDR file. As this plane, known to be aerodynamically efficient, was clean and diving, it could not possibly slow down significantly in those last few seconds as it passed the Navy Annex, even if, contrary to witness reports, it was throttled right back. Given the weight of evidence from the FDR file and radar, and the witness reports of the engine power rising, we reject the low speed estimates of 350 to 400 mph as flawed visual estimates without evidence. We will base our calculations on the official speed, 530 mi/hr, as a low estimate, and the FDR speed, averaged for the last four seconds, 552 mi/hr, as the more realistic estimate. Computation of the g-forces involves a calculation based on the speed and the radius of curvature of the path. To determine the gentlest possible turns we used Geogebra, which is a free, open source, geometry software tool. We devised a geometrical construction such that given an approach line, a turn-off point on the line, a way point (labeled North Citgo in the diagrams), a target point, and duration for the roll maneuver, we could produce left and right arcs with equal radii and a straight segment between them, mutually tangent to the two arcs, representing the roll maneuver. Fig. 3 illustrates a typical result. Figure 3: Path along the FDR route with turnoff level with Morin, 1 second roll time. The FDR track is shown in yellow, the left and right banks in red and the roll time in orange. The design limit for a Boeing 757 is 2.5g. Even if the plane somehow held together, it would be impossible to control during such an extreme maneuver. Note that this scenario already conflicts with the testimony of Morin who stated that he watched the plane fly a considerable distance and descend behind a row of trees, with only the tall tail fin eventually being visible. It can be seen from the diagram (Fig. 3) that the plane would pass too quickly out of his line of sight. Note also that in this case the plane would disappear left wing first, his view obstructed by the vertical wall of the Annex, whereas we recall that he describes the plane disappearing from the bottom up, so his view must have been obstructed horizontally by the trees. We also see that witnesses would have seen the plane change from a steep left bank to a steep right bank between the Annex and the Citgo service station, but no such maneuver was reported. If we now discount Morin’s description of the path of the plane entirely, and allow that he did not see it at all after it passed him, we can construct a scenario more favorable to the NOC hypothesis by moving the turn-off point earlier (Fig. 4). The last radar position provides the earliest point that the turn can reasonably be commenced. Morin’s observation that the plane flew nearly overhead is found to be preserved. Note that the curves are gentler. Figure 4: Path along FDR route with turnoff at the last radar position, 0.5 sec roll time. This scenario, which totally disregards the testimony of Morin regarding the path of the plane (and there appears to be no justification for doing so) shows a substantially reduced g-force. It is still so high, however, that only someone with the skills of a trained fighter pilot would have a chance of performing it. The bank angle is still extremely steep. Anlauf and Paik would have seen the plane in a steep left bank and Morin would have seen it in a steep right bank. Hemphill would have seen the plane crossing from right to left of his line of sight to the impact point, at a steep right bank, as he looked out of his office window (Figs. 3 and 4 show his vantage point). These people reported no such thing. Hemphill repeatedly asserted that the plane was on his right and flying straight, and therefore with no significant bank. In the FDR file the maximum bank briefly recorded during this period was just 6°. For these scenarios to work, the plane, after the roll, must maintain the steep right bank all the way to the Pentagon if it is to reach its target, which means the fuselage would have had to clear the roof of the Pentagon by nearly a wing-length, further straining the credibility of the “magic show” hypothesis. The bank angle in all of these runs is so far out of the range of normal that, if it had happened, it would have astonished all observers. It would have been widely reported, yet nobody reported more than a slight bank. Albert Hemphill described the plane so close to the ground that he speculated about ground effect, which is clearly inconsistent with any of the calculated bank angles. Several of the witnesses indicated that the plane was flying “flat” in the vicinity of the Navy Annex, hence flying straight.36 This is totally at odds with the necessary curve and bank angle. CIT has provided assistance here, handing some witnesses a model plane so that they could illustrate the bank. The bank they show is slight. In particular we note that not one of the 13 witnesses, who claimed they saw the plane well enough to believe that it was NOC, mentioned that it was extremely steeply banked. The bank angle would have been glaringly obvious and, because of its strangeness, unforgettable. The images used for these constructions are from Google Earth, with the history rolled back to September 12, 2001, (or September 13 for those of us west of the International Date Line). Note that, due to the camera location for this particular photograph, the roofs of the buildings are displaced a little south east relative to the footprints at ground level. The undulation of the landscape can induce similar small displacements. Positions relative to the footprints of buildings were used to avoid the former effect, and care was taken to centralize the point of interest in the screen, while placing markers, to minimize the latter. Since Geogebra is free, open source software, the reader can easily confirm this work and try other variations. We would like to thank the authors of Geogebra for the wonderful tool they have made freely available to the public. The construction we used produces two arcs of equal radius separated by a stated interval along a mutual tangent (the roll interval), with one arc tangent to the path of approach and the other passing through a way point and the target. Deriving the construction is left as an interesting exercise for the reader. where a is acceleration, v is velocity and r is the curve radius. where the denominator, g, (for Washington D.C.) is 9.801 m/s/s in SI units or 32.16 ft/s/s in imperial units. The bank angle is found from arctan(gh). CIT videos illustrate their concept of the flyover with a plane slipping unnoticed over the roof of the Pentagon in a horizontal orientation hidden by the smoke cloud. Referring again to the work of Jim Hoffman, who shows how easy it would be to see the plane flying over the Pentagon, even in a horizontal orientation, consider how remarkable his images would appear if he showed the fuselage a wing-length above the roofline at a bank angle of 77°, and the other wing protruding an equal distance higher, as it started to fly over the Pentagon. Figure 5: Imagine how riveting Jim Hoffman’s scene would be if the plane were banked at 77°. We have shown that at the very high speed the plane was traveling, and with the very short distance available for the turn, even a slight deviation from a straight path would require a steep bank angle. We can safely conclude that the plane must have been flying virtually straight, since many witnesses affirm and none (including those who reported a NOC path) deny that the plane was close to level. To claim that the plane could follow the NOC path without banking very steeply is to defy the laws of physics. It should also be noted that the plane is being asked to do two difficult things simultaneously. On the one hand it must bank steeply to force the plane round the required curve. On the other hand it must pull out of the rapid descent which witnesses describe. The FDR data show that the pull-up was largely confined to the last 2 seconds of flight and that an upward force was generated of about 2g. This would be easy for a plane which is close to level but at a bank angle of 77° the problem posed is far more difficult. The pilot, already pulling back hard on the control column to achieve the turn, would have to turn the wheel left to reduce the bank and create lift. This will use up some of the distance available for the turn. The pilot would have had to anticipate this need and start his turn even more steeply, and with more g-force than calculated above, in order to still arrive above the point where the smoke was to be generated. Even if the pilot managed to work all this out, and apply it at the precise moment required, he could not avoid passing over the Citgo service station, and some distance before and beyond, steeply banked, but this was not observed. It is evident that it did not occur. Given that there is no evidence the plane was steeply banked, and ample evidence that any bank was slight, simple physics and geometry show that the curved NOC path must be false. Furthermore there is no rational justification for the perpetrators to make the extremely difficult maneuver, which would not only endanger the plane but would also put the entire project at risk of failure. No one has made a case for a flyover on a direct approach, and there is no evidence for such an event. Voluminous eyewitness testimony, independent radar tracks from four separate agencies, the FDR data and the damage trail, place a large aircraft, consistent with a 757, at the scene approaching the Pentagon at a low level, at high speed and still accelerating. Impact with the Pentagon therefore cannot be avoided. It follows that the CIT claim that it would be impossible for the plane to do the observed damage, and that explosives would be required, is also false. The claim by CIT that the plane flew NOC, strengthened by incorrect calculations published by PFT, has caused many researchers to pay attention to arguments that suggest the plane did not hit the Pentagon. Those who have been convinced by a few photographs that appear to show a hole too small, or insufficient debris outside the Pentagon, are advised to reconsider the work of Hoffman,37 Legge,6 and others who have done a careful analysis of the plausibility of a 757 collision. It will be found that all of these arguments are flawed or unsubstantiated, leaving impact with the Pentagon as the only reasonable conclusion. The calculations we have displayed here show extreme values for the g-force required to deviate from the initial path to pass north of the Citgo service station, 4.3g being the lowest conceivable value, requiring that Morin’s testimony be totally set aside for no apparent reason, and the impossible 12.1g if some of Morin’s testimony is accepted. The bank angles are even more telling, since they would be clearly observable, 77° being the lowest possible. These values are confirmable by the reader using free software tools. The force calculated is well beyond the design limit for this aircraft, 2.5 g, and also above the likely strength safety margin. Control of the aircraft, even at the lowest computed g-force, would be impossible for other than a highly trained aerobatic pilot and the physical survival of the aircraft would be at least in doubt. The bank angle would be so steep as to astonish observers and be well remembered and frequently reported, but steep bank angles were not reported at all. Nothing more than a slight bank was described, even by those observers who claimed to see the path of the plane clearly enough to feel sure it was north of the Citgo service station. It is physically impossible for a passenger plane to pull sharply out of a descent at a steep bank angle. The plane was descending steeply but managed to quickly level off, hence could not have been steeply banked. It is physically impossible for any plane to pass NOC at the reported speed without banking steeply, hence the few witnesses who claimed to have observed the north path were necessarily mistaken about the path of the plane. Several such witnesses reported that the plane was flying level in the vicinity of the Navy Annex, in complete contradiction of the curved NOC path.36 The NOC witnesses are outnumbered by witnesses to impact by about 10 to 1, or about twice that if we disqualify the NOC witnesses who contradicted themselves by reporting that they saw the impact. There is a complete absence of witnesses to the plane flying over the Pentagon, though hundreds of people were in a position to see it and the sight would have been striking, commencing, or approaching, with a remarkably steep bank. If, as we have shown, the plane did not fly north of the Citgo service station there is no reason to suspect that it did not hit the Pentagon. If it was flying close to the ground in the vicinity of the light poles, as described by many witnesses, it could not miss. The FDR file, the damage to the light poles, the fence and the generator and the shape of the damage on the face of the Pentagon all indicate impact. All arguments used to suggest that the plane could not have hit the Pentagon have been shown to be unfounded.6,37 CIT is shown to be presenting a hypothesis which is physically impossible. According to the scientific method this hypothesis must be abandoned. It is to be hoped that those who have been puzzled by the apparently contradictory assertions surrounding the Pentagon attack, will now see that it is appropriate to withdraw support for the divisive notion that no plane hit the Pentagon. There are many disturbing issues which deserve our close attention related to the Pentagon attack, as have been clearly set out by Kevin Ryan 38 and others, but the question of whether a plane hit the Pentagon should not be on that list. Dr. Legge’s understanding of the events of 9/11 are set out his website: http://www.scienceof911.com.au/ which includes links to his research, authored and co-authored. According to Dr. Legge the evidence for explosives in controlled demolition of all three buildings is both compelling and obvious, hence the failure of NIST to consider this possibility is prima facie evidence of corruption. 17 FOIA video #1 shows very clearly from 21:14 to 21:21 the extent of the façade damage from the left wing. Video #2 shows from 3:30 to 4:14 the right wing tip damage. 33 Thanks to John Farmer, who kindly provided radar positions which he calculated, using proper adjustments for azimuth angle, from raw data he had obtained using FOIA. In this video at 7:47 we see that the top of the Pentagon is visible, thus Isobel James would have been able to confirm impact as, if the plane became hidden behind trees, she would be able to see that it did not emerge. At 7.55 we hear Morin describe how the plane disappears from the bottom up.